Yamaha RX-A1010 review | What Hi-Fi? So, what does the ‘A’ stand for in RX-A1010? ‘Aventage’, according to Yamaha; the company says it’s a whole extra level of sonic ability and attention detail. For example, this new RX-A1010 boasts a symmetrical power amp layout, a heat sink with anti-vibration and anti-thermal properties, an extra rigid chassis, and even a 5th foot, all of which is intended to make it more capable. And you know what? It’s a cracker. 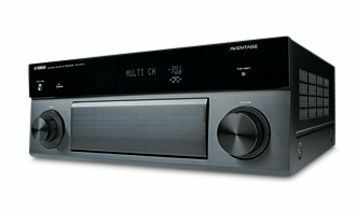 Play the Sucker Punch Blu-ray and it’s immediately clear that this is very different approach to that of the Pioneer VSX-LX55 and Onkyo TX-NR709. Where those receivers favour attack and precision, the Yamaha goes for power, body and spaciousness. The surround field is downright enormous – the speakers sonically disappear and the sound stretches from right next to the listening position to far beyond the physical constraints of the room you’re in. While individual effects might not be quite as exact in their position in the room, they flow around it with seamlessly, and the overall effect is mesmerising. It’s got texture, too, so the scenes in the dance studio, for example, sound like they’re really recorded in a dance studio, with authentic reflections from the square, unfurnished room. The unaggressive way in which the RX-A1010 flows means it’s happy with any material and almost any partnering equipment – there’s never any hardness or brightness, just fluidity, body, and sweeping dynamics. Of course, sometimes what you want is real attack and drive, and while the Yamaha loves a good gunfight or Metallica track, it is that little bit more reluctant than some to really let-rip. The exception is when you switch to the Sci-Fi DSP mode, which Yamaha was very keen for us to try and certainly adds an extra degree of punch to proceedings. However, while it certainly has its place (especially when you’re playing games), it sacrifices a little too much of the amp’s natural texture and expansiveness to be your everyday setting. And the spec? As substantial as you might expect: eight HDMI inputs and two simultaneous outputs, a boat-load of digital and analogue audio inputs, and plenty of upconvertable and upscalable analogue video inputs, including one of those fast-disappearing S-Video sockets. The USB port on the front is iPod compatible, or you can opt for one of the optional docks, and you get vTuner internet radio and Napster alongside DLNA streaming, which goes as far as 24-bit/96kHz FLACs in terms of format support and takes in MP3, WMA, AAC and WAV on the way up there. The Yamaha RX-A1010, then, is clearly a heftily specified – and hefty sounding – AV amp.